It's about time things got a bit more interesting over here I think. So say hello to a new feature for my blog - The Fashion Blog Run-Down. Since starting full-time work, I've got to admit, blogging regularly has become a lot harder. But on top of that, I've found it tricky to find time to comment on posts, or even keep up to date with my favourite bloggers. And that makes me mighty sad, I tell ya. So I had a little brainwave today. I've decided that at the end of every month I'll put together a kind of fashion blog run-down. It'll be a blast of outfits (that's the plan at the mo!) based on blogs I've read personally, but if anyone has a blog or outfit to shout about, I'd love to see it, so tweet me! I'm hoping that creating this post monthly will mean I can show some love for awesome blogs and outfits whilst keeping up-to-date with all everyone's cracking clobber. Expect to see some inspiring ensembles and frickin' good favourites. Let's see how this goes then! Summer is almost officially over. Just 3 more weeks left as we head into September according to my old mate Google. I've definitely started to think about my autumn / winter wardrobe. I'm already craving jumpers, hats and jackets. And it looks like a lot of other UK bloggers are too. 1. Amy's Topshop jumper is bloody divine. I've got a thing for soft fabrics (in a normal-as-possible way). I want a pile of fluffy jumpers to roll around in (and wear). Now. 2. Think I may have to nab this asymmetric skirt off of Tasha. It's ideal for autumn - that colour is perfect! If I don't manage to steal it, I'll have to get one myself. 3. Hermione's outfits always stand out as they often have a couple of pops of colour in them. 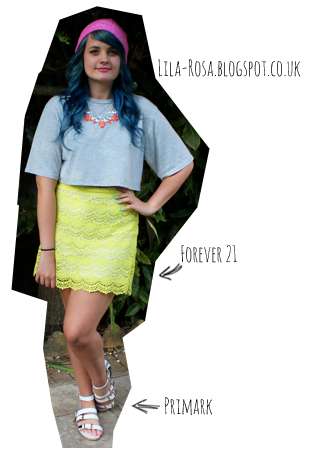 Her neon beanie looks fab with her skirt - definitely going to add a couple more to my collection! 4. This shirt dress that Charlotte is wearing would be awesome for layering up with as it gets colder. Must. Not. Look. On. Monki. Annnnd now I have many things to add to my A/W need list. Bet you guys do too! such a fun idea, looking forward to more! These outfits are all great, thanks for sharing these womens' amazing style! I'm so glad you're doing this - I love finding new blogs! I looove these kinds of posts! I already follow Amy and Tasha but I'll be checking out Charlotte and Hermione's now! Such a good idea for a blog! Totally agree...that asymmetric skirt is divine! I need me one of these! That skirt is the bomb.com!